Tooling Dynamics specializes in high volume, precision micro-miniature metal stamping and Swiss screw machining. Our expertise working with very thin gauge metals under extremely tight tolerances means we tackle the toughest jobs in the electronic connector world. For over 35 years, we've supported the electronic, medical, solar, aerospace, military, computer and automotive industries delivering engineering expertise and production services to meet your most demanding requirements and schedules. Stamping metal thickness as thin as .001 under extremely tight tolerances. Can machine very small parts up to .812 inches in diameter — with consistently excellent, highly uniform dimensions and surface finishes. For over 35 years, we’ve supported the electronic, medical, solar, military, aerospace, and automotive industries by delivering engineering expertise and production services to meet our customers’ most demanding requirements and schedules. We tackle the toughest jobs delivering engineering expertise and production services to meet your most demanding requirements and schedules. Our nearly 80,000 sq. 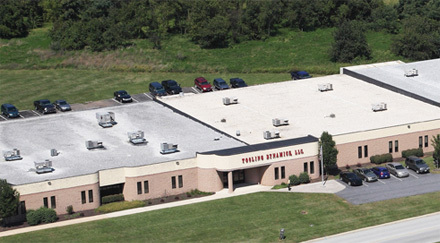 ft. facility located in York, PA is specifically designed to streamline our in-house manufacturing processes. Our nearly 80,000 sq. ft. Facility located in York, PA is specifically designed to streamline our in-house manufacturing processes. Take our video tour today or Contact Us to arrange an in-person tour of our facility.